Happy Monday friends! This is a very special week here on Lemon Blonde because I’m doing something I’ve never done before, a home decor themed blog series! As you may have heard on my Instagram, I’ll have a new blog post every day this week featuring an aspect of our home. This is something I’ve wanted to do for a while and I’m so excited to finally share! As I’m sure many of you can relate, it takes a while to decorate a home and my decor is constantly changing! I realized that I’ll never be 100% finished, but I’m excited to share what I have so far! Hope you guys enjoy! I’m kicking off this week with my living room and kitchen reveal! This is the part of our home that we spend the most time in, by far, and I’m so happy with how everything turned out. I’ve partnered with Ashley HomeStore to share the pieces we picked out for this space and to give you some tips for creating a Mid Century Modern aesthetic. Let's get started with the living room! We actually have two living rooms in our house, but since this one is attached to our kitchen, we end up spending majority of our time here with guests and even when it's just the two of us. When putting together this room, I looked for pieces that were simple and sleek, affordable, and aligned with our Mid Century Modern aesthetic throughout our house. Thankfully, I was able to find everything in one place at Ashley HomeStore. They have super affordable prices and a large selection of items for every room in your house. Since I spend most of my time in this room, I've already received a ton of questions from you guys about pieces you've seen on my Instastories. Let's start with the most asked question... my rug! One of my favorite pieces in this room, and one that you guys have asked me about the most, is this rug. I loved it online, but I loved it even more when I saw it in our space. With our floors being so dark, we decided to also go with a dark coffee table and a dark end table to match. I love all of the dark brown wood, but this light, fluffy rug really helps brighten the space and tie everything together. It makes our space feel super cozy and inviting. We get so many compliments on it whenever we have guests over- even Cort’s grandma said she wanted to buy the exact same rug! We found these amazing pillows that go perfectly with the rug. They have a cool, boho design and they add some fun texture to the space. They look great with our sofa and also go perfectly on our comfy leather chairs. We paired the boho pillows with these white, faux fur pillows for the ultimate cozy factor. Now, back to the coffee table and end table. Keeping with the Mid Century Modern theme, I made sure our tables had sleek lines and flared/peg legs for a retro feel. I love that even though they are different brands, the wood matches perfectly. While we’re on the topic of tables.. let’s move into the kitchen. I had a very specific idea in mind for the style of table I wanted, and this one hit the nail right on the head! I wanted a wood that matched our floors, and the table needed to have the quintessential Mid Century Modern legs. When I saw this table, I knew it was the one. I love that it fits 6 people comfortably, but it’s not too bulky. The space for our kitchen table isn’t huge, but this table was the perfect size to fill the space without being too big. I love the chairs that we paired with it. They’re super comfortable and once again, they match perfectly! 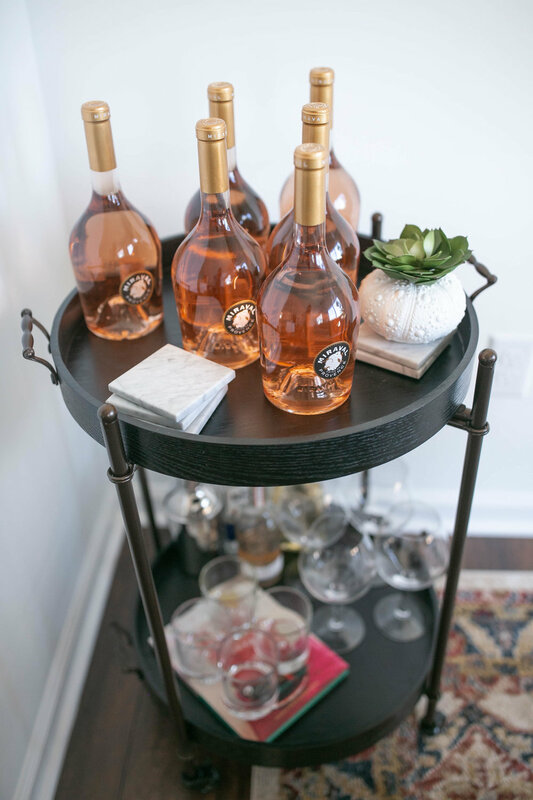 Our kitchen wouldn't be complete without this bar cart. I love that it's round and wooden, so it feels a little more sophisticated than my other bar carts I've seen. Lastly, we have our kitchen island. To be honest, we eat at our island a lot… maybe even more than our kitchen table! Whenever we have guests over, they typically gravitate towards the kitchen island (because that's where the food is of course! ), so I knew that good counter stools were a must. I love these because they’re comfy (check! ), they swivel (check! ), and the height is adjustable (check!)... and as a bonus, our guests always compliment them (check!). I was amazed with the selection of affordable bar/counter stools at Ashley and it was tough to decide on one style, but I’m very happy with these. I'm in love with the way that everything turned out in these rooms. It's our main living space and it definitely gets the most traffic so I worked really hard to make it cozy, inviting, but also keep it simple. I've linked everything below so you can easily find it on the Ashley site. Thank you guys so much for reading and a special thanks to Ashley HomeStore for sponsoring today's post!